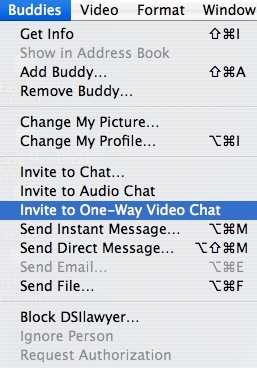 Yes, iChat supports a feature called one-way video chat. This feature will allow you to have a video chat even if the person on the other end does not have an iSight camera connected. To start a one-way video chat, select Buddies, Invite to One-Way Video Chat. You can also control click (or right click) on the person’s name in your buddy list and choose Invite to One-Way Video Chat. A video chat window will open showing you a preview of the image your friend will see on the other end. Once they accept your invitation, they will be able to see and hear you.